Computed Tomography (CT) is an advanced diagnostic imaging modality. CT uses a rotating x-ray machine to produce high-resolution, cross-sectional images. A moving gantry scans 360 degrees around the patient which produces thousands of images. These images can then be reconstructed and viewed in many ways. Standing CT allows a sedated horse to be scanned standing as the horse is gently moved through the CT machine on a floating hydraulic platform. However, to evaluate the lower limbs a general anaesthetic is required. CT scan allows multiple thin slices of the body part to be examined without the superimposition of other structures. Computer software allows the CT images to be viewed in cross-sectional slices in multiple planes. The scan only takes a few seconds but the preparation and positioning of the horse requires time and it is a better experience for the horse when not rushed. The CT scan is a non-painful procedure but the horse is required to remain completely still in a strange environment so will have to be sedated. Horses come in all shapes and sizes and some are too big whilst others are too small, but don’t worry, we will let you know if this is a problem. It is not possible for you to be with your horse whilst the CT is taking place as it exposes you to high level of radiation. If it is more convenient for you, you are welcome to drop your horse off prior to the scan and pick them up at a later date. If further investigation or treatment is indicated from the CT findings, then it may be necessary for your horse to stay longer. 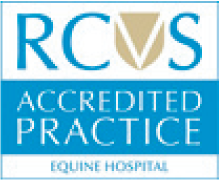 If you have been referred from another practice we will speak to your vet regarding any further investigation or treatment before going ahead. Evaluating and reporting a CT scan will usually take 24-48 hours. Most insurance companies pay for the cost of a CT scan. However, if your horse is insured please seek prior approval from the insurance company. Please do not hesitate to contact us if you have any queries or concerns regarding the procedure. The combination of endoscopy, over-ground exercise endoscopy, radiography, ultrasonography, nuclear scintigraphy, CT and MRI, allow us to offer the most advanced imaging modalities to our patients.